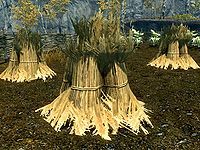 Wheat is grown in farms around Skyrim. 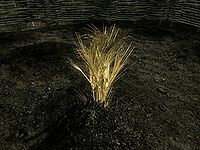 Several people recommend combining wheat with blisterwort to make a Restore Health potion. With Hearthfire installed, three wheat can be used to create a sack of flour. Wheat can be sold to most of the owners of the above-listed farms for the quest Gather Wheat, specifically: Addvild, Alfhild Battle-Born, Azzada Lylvieve, Belyn Hlaalu, Bolfrida Brandy-Mug, Boti, Katla, Reldith, Synda Llanith, or Tulvur. It is also categorized as raw food, and therefore it can be sold to innkeeper merchants. This page was last modified on 9 April 2018, at 06:40.